First on the List of Lovin is Friday, the most glorious day of the week, with all the weekend ahead of us. It's the Anticipation I love. Next on the List is Flat Caps, also known as Snap-Backs. These beauties modeled by my offspring are the Genuine Article, all the way from New York. And Boston. A gift from Aunty Kristen who has just returned from the U.S. of A. where they went with my talented nephew to audition for some prestigious ballet schools. Michael Jackson's ballet teacher (!) and given one-on-one tuition. Loving that SOMEBODY is organised in the morning. Or should I say the evening. Dash has taken it upon himself to set the table for breakfast each evening, and make sure the lunchboxes are packed and ready for the coming day. Dash hates to be late, so this ensures he is always on time. "I am so impressed with Dash's attitude this year," he said. "He's like a different kid. He's on fire on the football field, his attitude is great, he's a real team player; but also his whole demeanor is just lovely. When he comes into the office, the way he speaks and asks for things, his manners, it's just lovely...."
I can tell you I got quite choked up. We've had our struggles over the past two years. THIS year is going to be different. Love. That. And Finally. 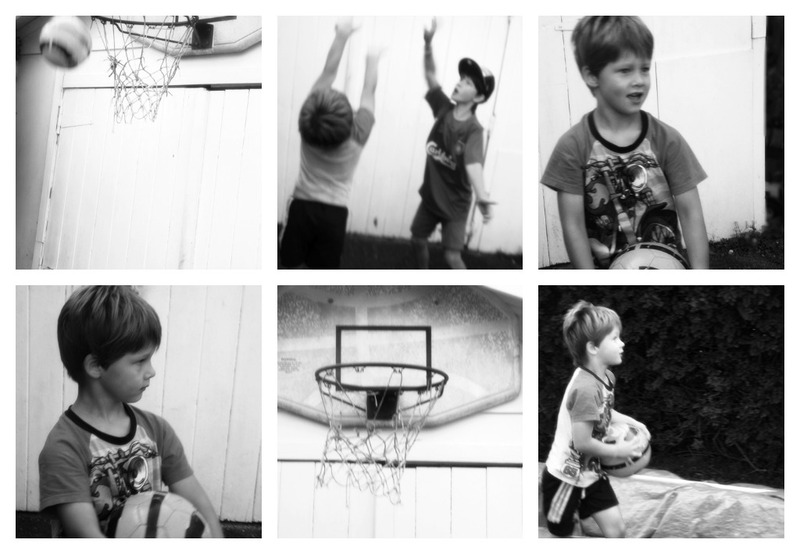 I am loving my own little Michael Jordan - Scrag - who wants to be known as M.J. He was inspired by the movie Space Jam (which he must have watched ten times) and has been out shooting hoops and playing basketball ever since. He's four. And very tall. (He wears size six clothes already, and Dash's hand-me-down t-shirts go directly to him, instead of languishing in drawers waiting for him to grow into them. He's going to be the tallest of my kids, I just know it). A month ago he was using the rubbish bin to reach the hoop. Now he can slot one in from the ground, with regular ease. He is taking on his big brother at every turn, loving the competition. I am having to rethink my plans to get him into Rippa Rugby this year... wondering if maybe there's a basketball league for little guys with big dreams instead?